Most people have had enough by now. Your abundance of faith disturbs me. 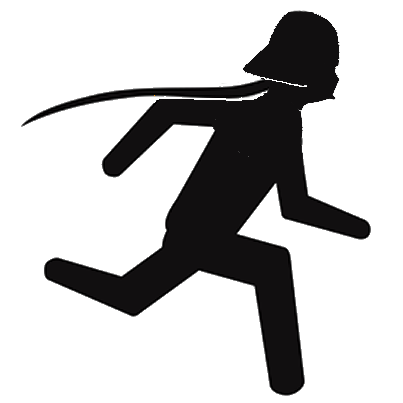 I started the Darth Valley Challenge in 2010 just to see how tough I could really make a run. The fact is I’m 42, not very fast, and rounder in the middle than I’d like… I don’t have the strength and endurance of the Badwater athletes, or the speed of a sprinter. But I like to think I have heart. I chose the one-mile sprint because it probably won’t kill me. I could run farther, but as well as potentially injuring myself I might encourage others to try it – and I really don’t want to do that. Yes, it’s utterly, insanely tough to sprint for a mile in that heat, but funnily enough it’s the breathing that’s hardest – even with new air holes it’s still almost impossible to get any air inside the mask. Especially with the balaclava on underneath. As for the heat itself, I estimate that inside the mask it’s probably 180 degrees… and you’re mostly breathing your own CO2 for the last half-mile. Some people collect porcelain kittens. I run in the heat. I do it partly because I love the look on people’s faces as they pass by in their air-conditioned cars – the bewilderment, the innocent, wide-eyed expression of pure disbelief. It’s great. In 2010 I managed 6:19 for the mile, and in 2011 it was 6:13. Unfortunately I was injured doing a ten-mile warm-up for 2012, and my time was a pitiful 8:20. I’d like to thank the folks who turn out each year to support and be a part of this fun challenge, especially Laura, Randy, Hannah, Tracy, Jason and Carrie.